Are you interested in commissioning a special painting for your home or office? I am pleased to accept commissions for custom artwork of various subjects and sizes, in watercolor, oil and charcoal. The price of unframed custom work depends on size and technique. After we discuss the subject, elements to be included, and format of the artwork you want, I submit compositional sketches for idea development, then a full-size sketch for your comments. Upon your approval of the final sketch, I start the finished piece. While I prefer to see the subject personally, I am able to work from your photographs. Payments are in three parts: at the start, upon approval of the full-size sketch, and at completion. While I cannot quote an exact price for a painting before knowing more about the project, the following can be used as a guide for pricing custom unframed work. Watercolors: small (11" x 15") $1,800; medium (15" x 22") $3,500; large (22" x 30") $4,800. Oils: (18" x 24") $7,500 to $9,500. Other sizes are available in watercolor, oil and charcoal. – N.R. 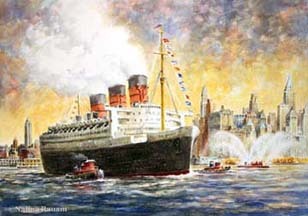 Please email me at SeaportArtist [at] gmail.com or call 212–964–8465 for more information or to discuss your ideas. With two requests this year for oil paintings of buildings, my interest in architectural portraits developed and quickly grew. It was such a pleasure getting to know the buildings, and studying them closely to better portray their appearance and their spirits on canvas. 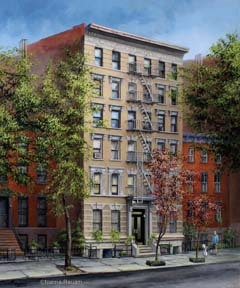 The two paintings shown below (Blatt Billiards and Late Spring on West 11th Street) are scenes in New York City. I took the opportunity of visiting the buildings several times, to see how they looked at various times of day, and in different light conditions. By the time the paintings were finished, these buildings felt like old friends. 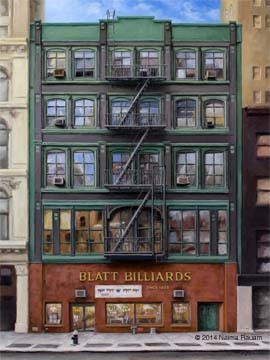 Blatt Billiards, oil, 24" x 18"
On Broadway near Union Square, New York City. Late Spring on West 11th Street, oil, 24" x 20"
Greenwich Village , New York City. 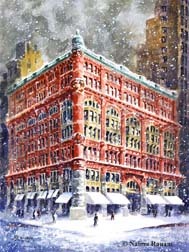 841 Broadway, New York City , watercolor, 14" x 10"
This was commissioned by John E. Osborn P.C. and became the Firm's 2008 holiday card. 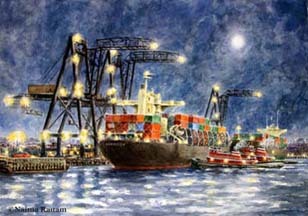 A montage of time and space, this painting tells the history of Harbor Seafood Company. 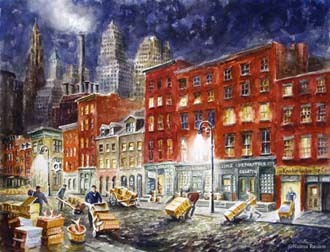 In the spring of 2012, I completed a watercolor of old Front Street for a couple at the South Street Seaport in New York City. I recorded the process with a step-by-step overview of how it was created. To see this, please go to Talking About Art. 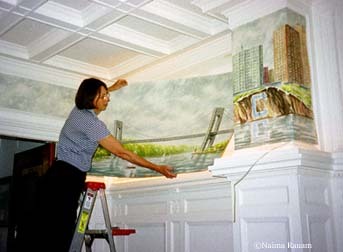 Above: Six-panel watercolor mural: New York City Waterfront. Installed above wainscoting in the dining room of a pre-war apartment building on the Upper West Side of Manhattan, these panels ring the room. A long dining table is in the center. I supposed it to be Manhattan, and the watercolors are views as seen from the east and west sides, and the lower and upper tips of the island. The panels are 30 inches high and from 60 to 181 inches wide. 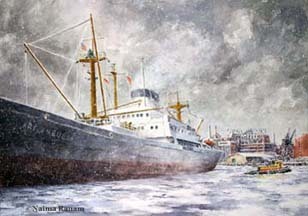 Above: The oil painting on the left was commissioned in the mid-1980s by the owner of Darik Enterprises. 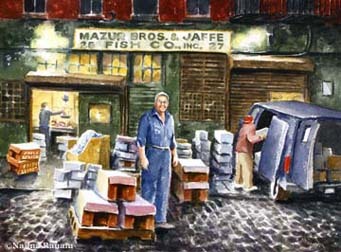 It shows his wholesale shrimp business on Fulton Street in Manhattan. 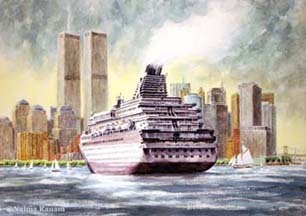 The company had moved to Woodside, Queens a few years earlier. Twenty-five years later, his son commissioned the oil on the right. 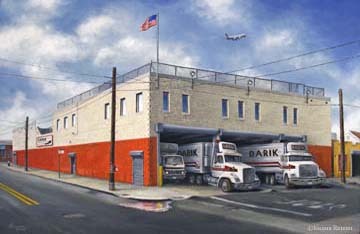 It shows Darik Enterprises in Woodside. The company was again moving, this time to Long Island. Both oils now hang in the new Darik Enterprises headquarters in Lake Success, New York. My treatment of the two paintings is quite different. The earlier oil is infused with a softness and charm of time past, and bespeaks fading fond memories. 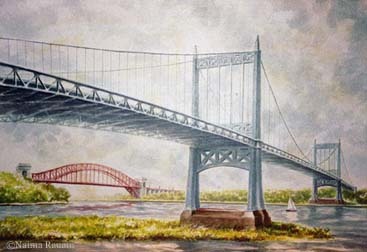 The newer painting is crisp and to the point, taking on the character of the no-nonsense neighborhood of work and industry that can be found in Woodside. 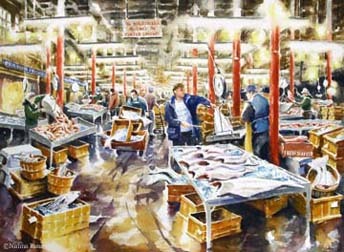 Above: I have had many requests for watercolors recreating past scenes from the Fulton Fish Market, often including someone's relative, a father, grandfather, or son, for instance, buying fish or standing by their business. 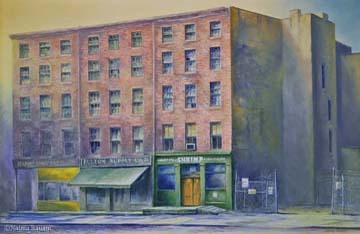 A touching remembrance: One of the first commissions I received involving the Fulton Fish Market was from a man whose father was a mounted policeman on South Street in the 1920s. The man never knew his father, who died before the man was born, and he wanted a remembrance of him. He commissioned me to paint a watercolor of his father on patrol in the Fish Market. I had to construct a real life moment I had never witnessed. The man brought me a black and white photo of a handsome young man in uniform, proudly sitting on a fine chestnut horse. The photo had not been taken in the Fish Market, so I researched the appearance of South Street in the 1920s and placed the figure in my composition, taking color cues from the actual buildings, all still in use in 1984. I was pleased that my painting connected him with his father.